An exact contemporary of Bach, George Frideric Handel was one of the most important composers of the Baroque era, carving out a career for himself which was equally as impressive as his fellow countryman�s. Born in Halle, Germany, to parents who were initially opposed to his devotion to music, Handel soon moved from his hometown to the great operatic centre of Hamburg. The opportunity to meet people from around Europe led to a rapid development of his skills, and, influenced by the Italian style that was gathering pace around him, the composer took the opportunity to travel to Italy, staging 'La Resurrezione' in Rome in 1708. Handel�s reputation soon picked up, and in 1710 he became Kapellmeister to the Elector of Hannover, Prince George, who would soon become King George I of England. The connection with England had been established, and Handel moved there permanently in 1714, helping to found the Royal Academy of Music five years later. When the new Covent Garden Theatre was established in 1736, Handel celebrated the opening night with a performance of 'Alexander�s Feast'. Following his operatic success, the composer turned to oratorios, starting with the biblical 'Saul' and 'Israel in Egypt', and premiering 'Messiah' in Dublin in 1742. The next year, despite suffering paralysis in his hand, he completed 'Samson' and the 'Dettingen Te Deum', with 'Semele' appearing in February 1744. Five years later came one of his most popular works, 'Music for the Royal Fireworks' - up to 12,000 people attended the first performance, an indication of just how popular the composer was in his own lifetime. 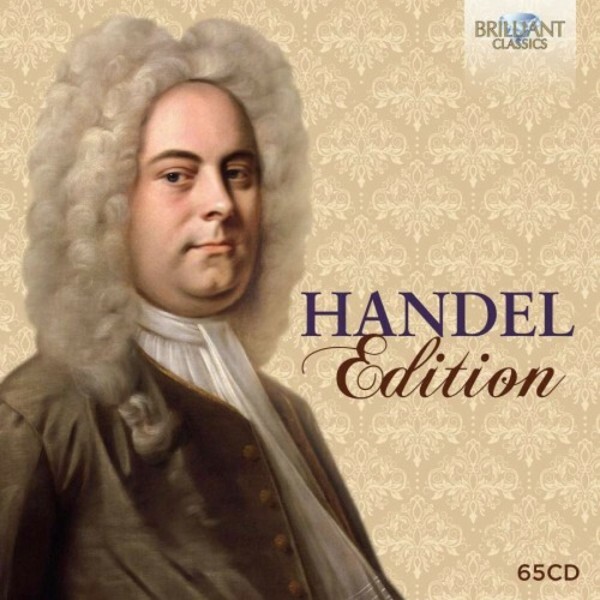 Although he was most famous for his opera and oratorios, Handel composed a large amount of keyboard music; among the works featured on this compilation are the Suites de pieces pour le clavecin, the first volume of which appeared in 1720. His chamber music (mostly solo and trio sonatas) also makes up an important part of his oeuvre, with his best contributions to this genre contained in the Opus 2 collection (included in full on this release), which comprises sonatas for oboe, flute, recorder or violin and represents the perfect summation of the composer�s wealth of invention and expressivity. Handel was also an expert orchestral writer, composing purely orchestral music alongside music for his dramatic works. The Water Music, justly some of his most celebrated music today, was the first in England to be scored for horns; and the Music for the Royal Fireworks was a massive project, with three horns and three trumpets combining forces to create the sound necessary to carry outdoors. Both these works and an array of other orchestral pieces are included on this substantial box set. A wealth of artists � both established and emerging � make up this Brilliant Classics release, once again representing astonishing value for money. Handel�s orchestral music is performed by a variety of German chamber groups, including the H�ndel-Festspielorchester Halle, and the ensuing oboe and organ concertos are played by Baroque experts City of London Sinfonia. The trio sonatas feature L��cole d�Orph�e, which boasts players drawn from some of the leading British Baroque orchestras, including the Academy of Ancient Music. The consistently high quality of playing continues with Roberto Loreggian performing Handel�s harpsichord music, and legendary soprano Arleen Aug�r singing his German arias. Sir David Willcocks conducts the Holland Boys� Choir in the Coronation Anthems, including the ever popular Zadok the Priest, and arguably Handel�s most famous oratorio, Messiah, is performed by the Choir of King�s College, Cambridge, conducted by Stephen Cleobury. An excellent gift idea, this release represents superb value for money and hours of listening pleasure. Excellent performances by leading ensembles, soloists and choirs: Concerto K�ln, Neues Bachisches Collegium Musicum, English Chamber Orchestra, King�s College Choir and many others.